Up For Grabs: a Ticket to Mars. Tryouts Start in 2013. 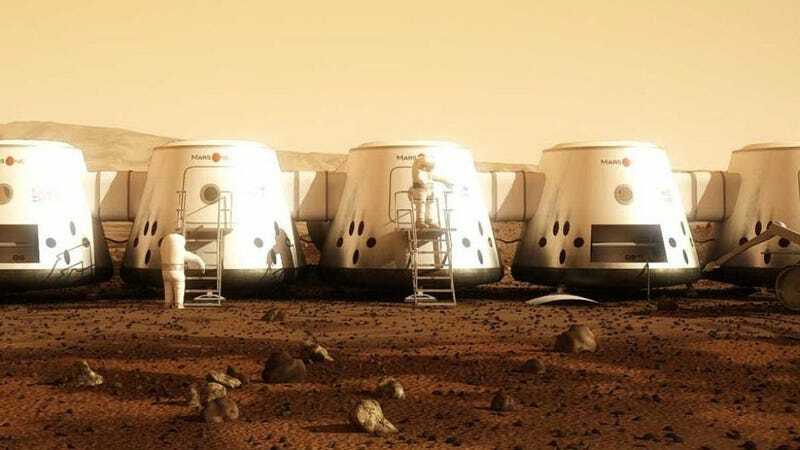 The Mars One project wants to send you on a trip to the Red Planet by 2023. Yes, really. There's just one caveat: it's a one-way trip. Think you're up for it? Next year, Mars One will hold a worldwide lottery to select 40 people to train to be civilian astronauts. That group will be sent to live in a desert simulation for three months, after which the initial pool will be whittled down to 10. By 2023, this group will be sent to Mars to form the first permanent human settlement. Once the new settlement has begun to thrive, the possibility for a return visit to Earth may open up. Still, that's not guaranteed. Says Lansdorp, "our astronauts will be offered a one-way trip. We have no idea when it will be possible to offer return tickets." To be honest, the whole idea sounds a little out there, but the project has received interest from an impressive assortment of aerospace companies, including Astrobotic, ILC Dover, and yes, even SpaceX — which means this thing could actually happen. Think you could spend the rest of your life living on a barren planet, with no guarantee of ever coming home? We expect to see your name in the lottery, come 2013.